Rusunawa (low-cost apartement) Daan Mogot in Cengkareng, West Jakarta had been occupied by hundreds of household now. But, the occupants still meet problems due to damaged road access towards the flat. "The road often muddy and waterlogged "
Lisma (48), block B occupant said, the citizen often troubled to do their daily activities because the road with 300 meters in length and 5 meters in width is often waterlogged and become muddy after rain.
" 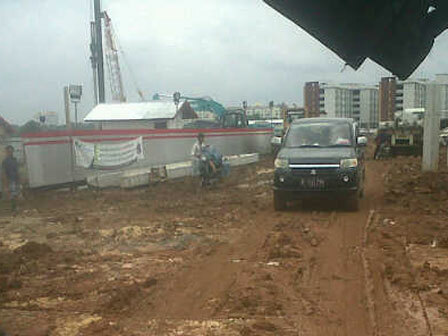 The road often muddy and waterlogged ," said Lisma, Tuesday (12/9). Due to this condition, she and 136 other citizens wish the road access to be immediately asphalted or concreted. So the citizens can easily pass the road even in rain. "The road damaged because there is still mosque project besides the flat," added Lisma. Responding to this matter, Anas Effendi, West Jakarta Mayor admitted, he will directly sent letter to Jakarta Public Works (PU) Department to repair the road. "Road access is a vital facility for all flat citizens. The flat is already in finishing stage, so no wonder if they asked for better road condition," Anas stated. According to him, three out of eight towers have been occupied by Mookevart and Grogol river bank residents. Those are block B, C, and D. Meanwhile, block E, F, H need to be cleaned and ready to be occupied for 104 families. "Tower A and G will ready in February 2015," he disclosed.